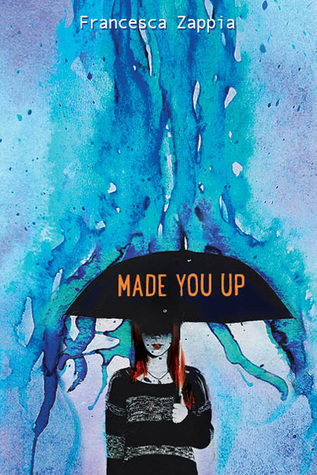 I recently finished reading "Made You Up" by Francesca Zappia, a young-adult novel about a schizophrenic teenager finding her way into normality. Alexandra is a high-school senior who's recently shifted schools. Over the summer, she makes a friend while working at a restaurant, and uses the owner's Magic 8 Ball to navigate through both her paranoia and schizophrenia. While waiting on a customer, she bumps into a character she from her childhood, whom she always thought that she'd imagined. When she realizes that he goes to her new school, she's confused by the fact that everyone else can see him as well. Alex uses her camera regularly to take pictures of what she feels might be a product of her schizophrenia. Over time, the reality is captured in the image, and the imaginary items fade away, allowing her to have a clearer recollection of what happened. It seems however, that Alex doesn't need to take a picture of "Blue Eyes", because everyone else already thinks that he's real. As the new school year begins, she finds that she's in six classes with Miles ("Blue Eyes'" actual name). Her exuberant curiosity shines through all of her thoughts, which constantly include the Magic 8 Ball, her younger sister (Charlie) and "Does Miles remember me?". For some unknown reason, relating to an incident that occurred at her previous school, Alex is put into the community service team, that basically sets up the gymnasium for the sports teams' practice every day. This team also, is head by Miles, and is a place where she gets to know him better, and make some new friends. Battling stereotypes and high-school classifications in a school where her real identity is concealed, Alexandra makes her way to parties, restaurants and classes, almost like a normal teenager, until her schizophrenia kicks in again. I'd recommend this book to fans of young-adult novels, or of contemporary fiction. It has very expressive, colloquial language, therefore the language does not stand as a barrier between the reader and the author. I'm definitely no expert on schizophrenia, but I do believe that she portrayed it well in the sense that Schizophrenia effects everyone in a different way, therefore the reactions that characters have cannot be generalized.